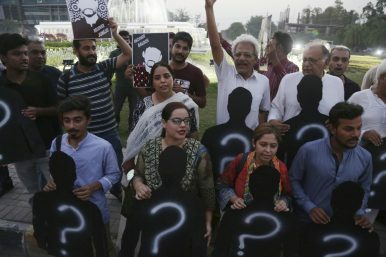 Pakistani human rights activists rally on International Day of the Disappeared in Peshawar, Pakistan (Aug. 30, 2018). We met the silent and lost Ahmed in Karachi when he was brought to the metropolitan city for routine checkups with a psychiatrist. Medication keeps him in a semi-stupor and he rarely talks; despite many attempts, he did not respond to us. When his younger brother asked him if he was beaten and interrogated in captivity, Ahmed left the room without a word. The Plight of the Gwadar FishermanBalochistan’s Missing PersonsPakistan’s War Against “Miscreants”Balochistan’s Great Internet ShutdownPakistan's Women Marched for Their Rights. Then the Backlash Came.